Mention finding us online for 10% off! Offering a selection of new and used parts! When you come to Irving’s Used Auto Parts you will be greeted by Shane, Sheila, Kandace, or Brenton. When you find the perfect part for your car Shane and Brenton will be more than happy to pull the part out for you. If something has happened and you can't come pick up your parts we will deliver for anything $50.00 and over. We are here to do everything we can to help our customers. If you have a junk or wrecked car that you don’t know what to do with, call us! We will pay you for your vehicle and tow it away at no cost to you. This is a great way to make money off of something that is just sitting in your yard. Irving’s has been long known as the area’s best location to find auto parts. Although we specialize in used auto & truck we also carry new auto parts, so don’t hesitate to call us if you are shopping around for a new one. We update our inventory on a regular basis to guarantee that we have a wide selection for our customers to pick from. Stop by for the part or vehicle you need or call and let us search for you. Let Irving’s make your Auto Junk Yard & Used Auto Parts search so much easier! 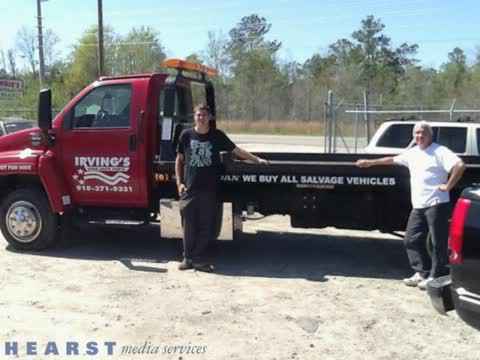 Please visit Irving’s Used Auto Parts for Used Parts in Wilmington, NC. We also accept payment by cash.